To better meet your and your caregivers’ needs, HYGEIA has incorporated training by the healthcare professionals treating you to the services it offers. They can assess your condition and offer any advice you may need. Training is adjusted to the needs and capabilities of patients and their families. It includes whatever you may need to know so as to handle any issues that may arise. HYGEIA Hospital implements an Infections Control Program, in accordance with the international regulations for the control of hospital infections or community infections in general. Hand washing is the most effective way to prevent the spread of germs and infections, in and out of hospital. It is extremely important to wash your hands before and after using the bathroom. Depending on the medical procedure or treatment you are about to undergo, you may be asked to wash your hands with antibacterial soap to limit the risk of infections. If your friends, relatives or family manifest any symptoms of infection (such as coughing, sneezing, diarrhea or suffer from an infectious disease) ask them not to visit you. Do not sit on other patients’ beds and do not allow your visitors to sit on your bed. For your own safety, please limit the number of visitors. You may receive a copy of your medical record 3 days after your discharge. To avoid any hassles, we inform you that you need to present valid ID. In the event that your medical record is picked up by a third party, proper authorization, validated by a competent Greek authority, must be provided. Click here for the Documents needed. 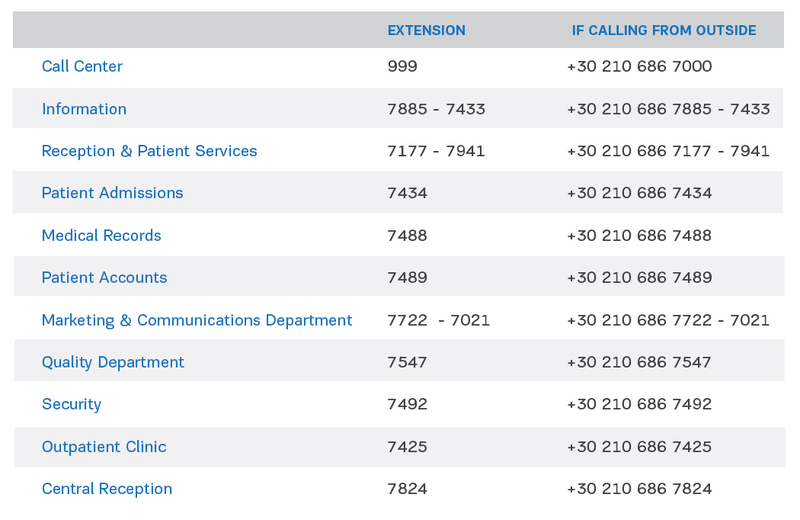 For an external line, dial “0” and then the phone number you wish to call. There are payphones on all hospital floors. The use of mobile phones is not permitted in certain areas of HYGEIA, as this may cause disturbance or interference. These areas are clearly marked. Please ensure that you adhere to this regulation. Phone charges will be billed to your final account. For any issues, please contact Patient Admissions.